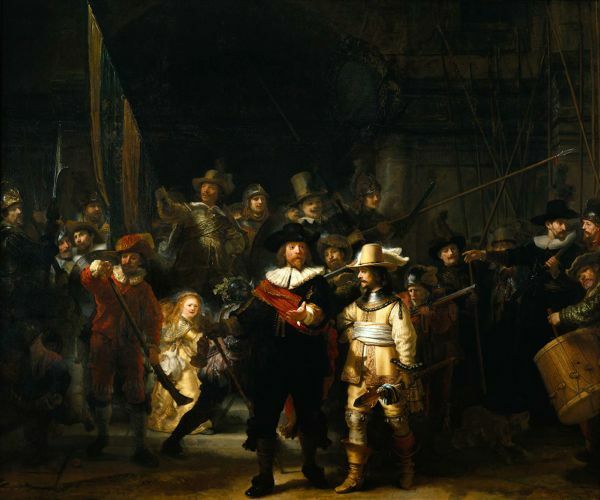 The title of Rembrandt's "The Night Watch" is completely inaccurate. The painting doesn't depict a military surveillance at night, nor is it set in nighttime. Once the painting was given a good cleaning after World War II, it became clear that Rembrandt painted his scene in bright daylight, as the sunny shaft of light shows. What is fascinating about this painting is that it is actually a commissioned portrait. Many of the figures paid for inclusion. Rembrandt's composition was revolutionary, however. Rather than a staid replica of faces, he created a highly dynamic scene, adding in extra figures for more drama.